The old cliché “Gone up the River” takes on a whole new meaning in South Florida. As a child, I would often hear my mother and her friends sit on the front porch and talk about young men from the neighborhood that have gone up the river. I often wondered what that phrase meant. “Gone up the river,” as I have come to understand, is when someone is convicted of a crime, incarcerated and sent away to a facility to serve out their imposed sentence. While serving their sentence the expectation is that they will be rehabilitated. In some cases that means educated, treated for drugs, alcohol and/or mental illness and sent back to their families and communities a more productive citizen. A “river” meant to teach you how to swim in mainstream society and, when you reach the bank, return redeemed as a productive part of that society. That’s in the best possible circumstances. 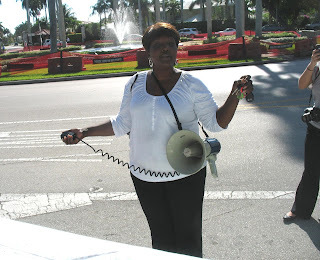 Recently in Florida the private prison industry attempted to take over the river that runs through South Florida. The private prison industry, armed with a huge bank roll of campaign contributions and several well paid lobbyists, aligned themselves with the presidents of the Florida House and Senate and the Governor who was treading water in an attempt to curb sixth consecutive annual budget deficits. Senate Bill 2038 would have privatized 27 prisons and work camps in 18 counties from Charlotte County to the Keys. More than 4,300 state workers would lose their jobs, though many likely would be offered them back, at less pay and benefits, working for a private prison company where training and safety often take a back seat to the bottom line. The plan to turn over 27 publicly run prisons to the private prison companies was projected to save $16.5 million a year at the cost of workers that have not had a raise in six years. The private prison industry would have us believe that privatization is the solution to our budget crisis and that they are the saviors to our massive over incarcerated souls, while all the time they lobby for “tough on crime” laws that would incarcerate more people and keep them incarcerated longer. Community-based rehabilitation services and less incarceration are bad for the private prison business. Ask yourself, are we now living in a country that nothing matters but how to do it cheaper. If I owned a business and you told me that you can manage by business at a 7 to 10% savings and make a good profit for yourself. My next question to you is, how do you get those profits? The Governor and the Presidents of the House and Senate did not want to know how and tried to bully their colleagues that did and asked difficult questions. WHO WOULD SUFFER IN THE HOW OF PRISON PRIVATIZATION? The opponents of this massive prison privatization in Florida never gave up. Against all odds the labor unions, community groups, faith leaders, students, tea partiers, and legislators from both sides of the aisle took a stand and we stood! WE STOOD against bullying, threats, private prison lobbyists, reports full of fiction, and paid-for politicians. We stood and we are still standing by the banks of the river, called mass over-incarceration. We get tired but we don’t give up. We continue to work together for real solutions and we are not afraid to answer the real question of HOW. How do we begin to reduce our prison population, lower our criminal justice budgets across the county? Let’s start by getting rid of the riptide in the water called the PRIVATE PRISON INDUSTRY. Gail Tyree, Justice Soros Fellow hosted by Grassroots Leadership, "Your Sister in the Solution."